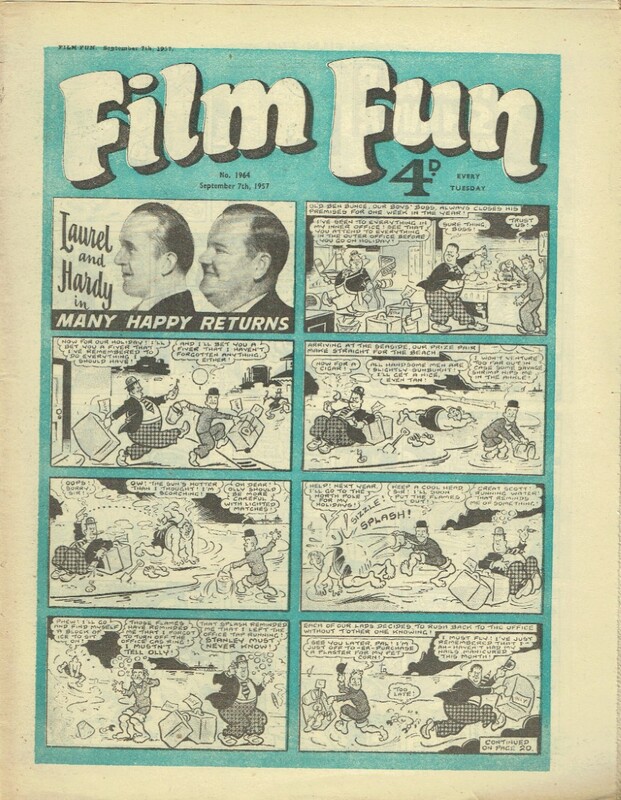 Film Fun was a British celebrity comics comic book that ran from (issues dates) 17 January 1920 to 15 September 1962, when it merged with Buster, a total of 2225 issues. There were also annuals in the forties and fifties. It was renamed Film Fun and Thrills in 1959. As the title suggests, the comic mainly featured comic strip versions of people from films from the 1920s to the 1960s. Pre-war circulation at its peak was around 800,000 copies per week. The cover of the first edition featured Harold Lloyd but named as “Winkle”, the screen name by which he was known in Britain at the time. Picture Fun merged with Film Fun soon after its launch in 1920, followed by Kinema Comic in 1932, Film Picture Stories in 1935, Illustrated Chips in 1953 and Top Spot in 1960.In 1962, sales of Film Fun dropped below 125,000 a week, prompting IPC to merge the comic with Buster. Apart from Laurel and Hardy, Film Fun used to feature many film and stage comedians of that era like Charlie Chaplin, Abbot and Costello, Buster Keaton, Ben Turpin, Jackie Coogan, Fatty Arbuckle, Joe E. Brown, George Formby, Wheeler & Woolsey, Max Miller, Lupino Lane, Red Skelton, Harold Lloyd (named Winkle in those days),W.C. Fields, Terry-Thomas, Sid Field, Frank Randle, Morecambe & Wise, James Cagney, Tony Hancock, Sid James, The Goon Show, Frankie Howerd, Tommy Cooper,Martin & Lewis, Arthur Lucan (in his drag role as Old Mother Riley) and Bruce Forsyth. There would also be serialised cowboy films featuring stars like Roy Rogers and Gene Autry. There were also detective stories featuring a fictional detective named Jack Keen.